My name is Bryan and I have a problem. I’m addicted to organization and it’s starting to consume me. 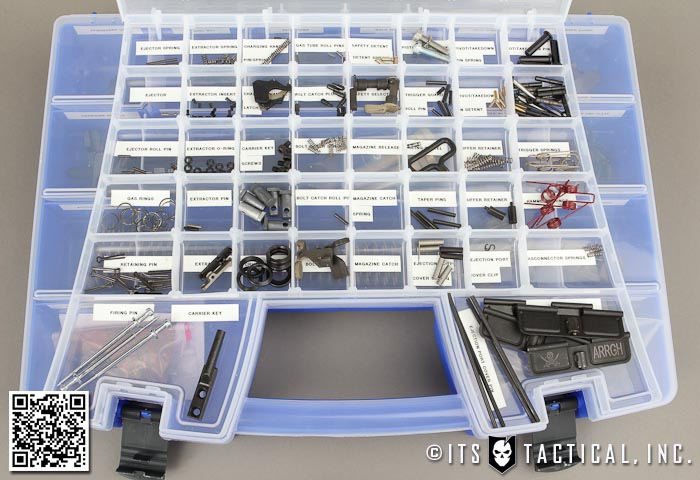 All kidding aside, I do like to keep things organized, including all my spare parts floating around for my AR builds. 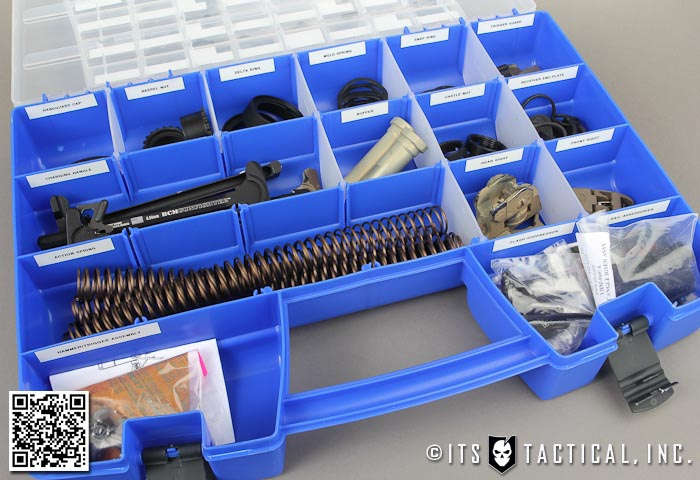 I was inspired a few months back by a photo Stickman put up showing how he organized his parts and I’ve been looking for a way to store even more. I wanted something that literally had a spot for every part to keep an AR running. 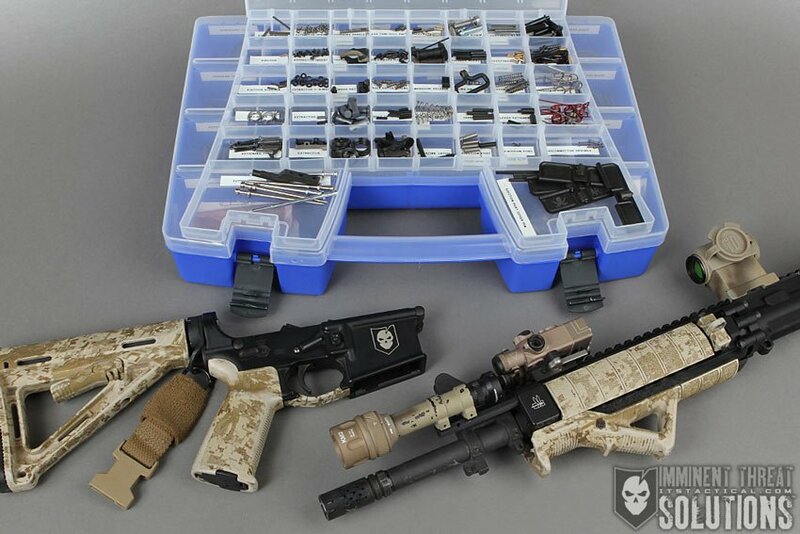 While it certainly doesn’t take all the parts shown here to do that, I like to be prepared and have enough to keep everyone’s guns around me running too. My other requirement for a case was to have something that was easy to transport, preferably with a handle. I finally found all my requirements in the Akro-Mils 6318 Case, available here from Amazon for around $25. 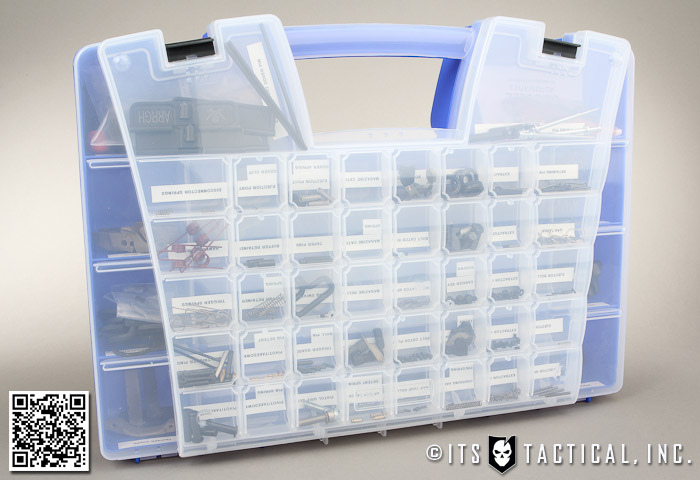 What I really like about this case is the awesome top section that has 42 individual small compartments and the bottom section has another 20 compartments. To open the case you flip open the tabs, yet the top section is still secure, again which I like. The top section is also secure enough compartment to compartment where small parts don’t roll to another compartment and get mixed around. 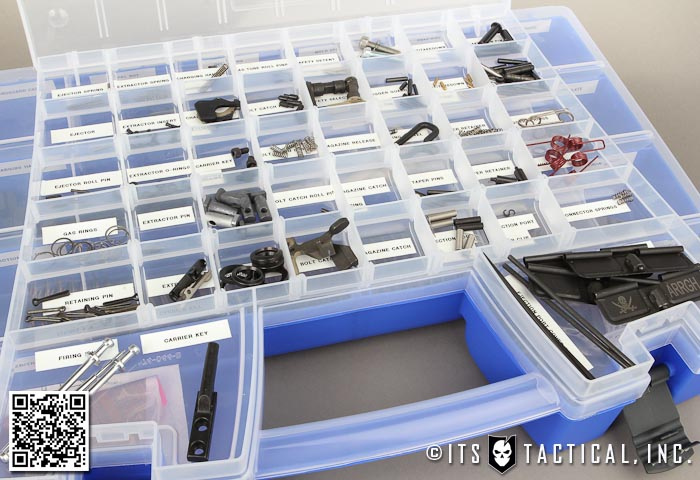 The top and bottom section dividers are removable and customizable, so by trimming off a divider, you can create larger compartments. As you’ll see, I’ve done on the bottom to hold longer items like the Action Springs. 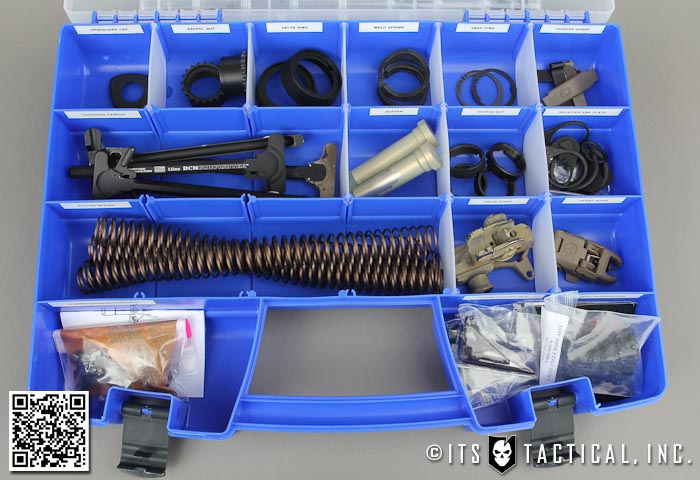 If you’re interested in sourcing each of these parts, I buy my individual parts from Brownells. They’re great about backorders too. They ship what’s in stock to you immediately and the backordered items ship individually as they receive them. 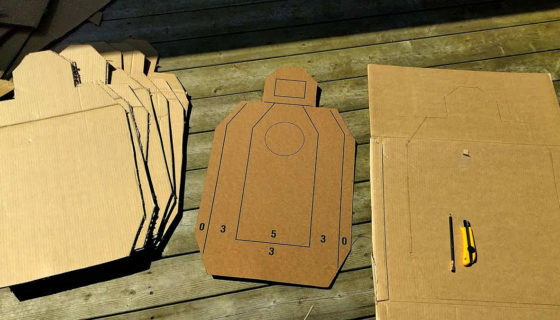 I know this costs them on shipping, but it’s something I admire about the way Brownells does business. 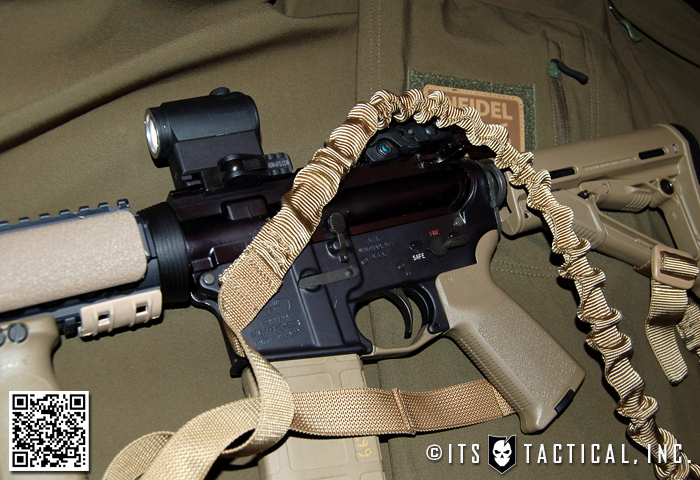 I also pick up what I can at Bravo Company USA and I really like their MPI’d Bolt Assemblies. As you’ll see, it’s one thing I’m missing from my parts, that’s what comes from being the guy that has parts to share though. If you guys are interested in a full on inventory list of what I have here, let me know and I can put something together with direct links to where you can pick them up. Brownells has a really good search engine now on their site and things are fairly easy to find now. It used to be impossible to search for anything on there. 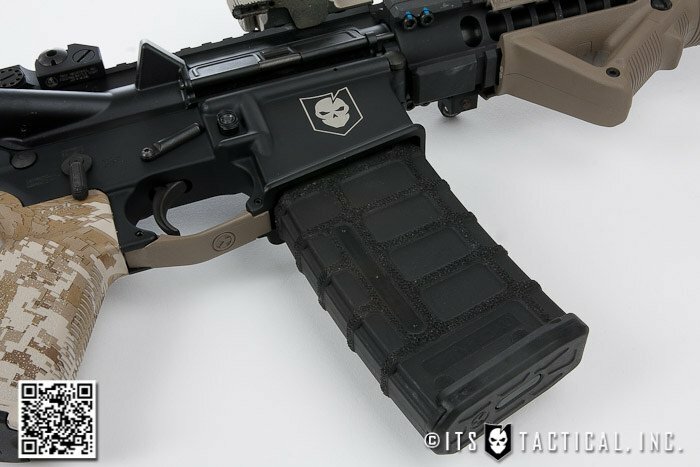 You can also take a look at our DIY AR-15 Build Series for tips on parts to purchase and of course how to build your own complete AR-15 from a stripped lower receiver.